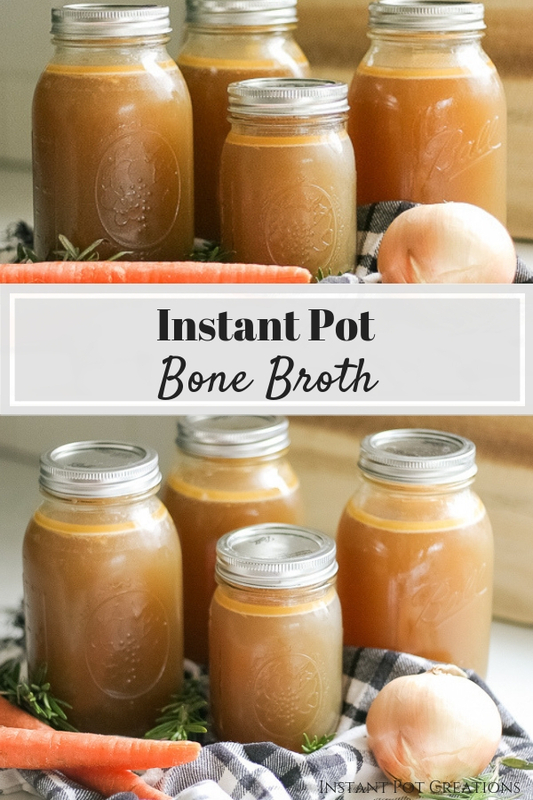 Instant Pot Bone Broth - Jenuine Home - Interior design, decor, diy for your home and Instant Pot Creations for your tummy. I have a secret that I’m embarrassed to admit. I never even tried making bone broth until last year. I had owned my Instant Pot for about 2 years before I even tried making bone broth. I felt it was too overwhelming, took too much time and wasn’t really worth making from scratch since I could easily buy packaged chicken broth from the store. I was a busy mom and didn’t have time to do one more thing from scratch like making my own broth. It’s so easy to make. Just dump the bones in the pot, some veggies (scraps), seasonings and water. Less than 5 minutes to prep. It only takes about 2 hours to cook. Completely hands free. The taste. Oh my! What a difference homemade broth tastes like! So much flavor means all your dishes taste better. Makes it SO worth it. The healing properties in bone broth alone are worth making this at home. It contains collagen that comes from the tissues/bones and forms into a gelatin. This gelatin is full of amino acids and gives vitality to our skin and joints in our own bodies. Bone broth is rich in vitamins such as calcium, phosphorous and magnesium, among many others. 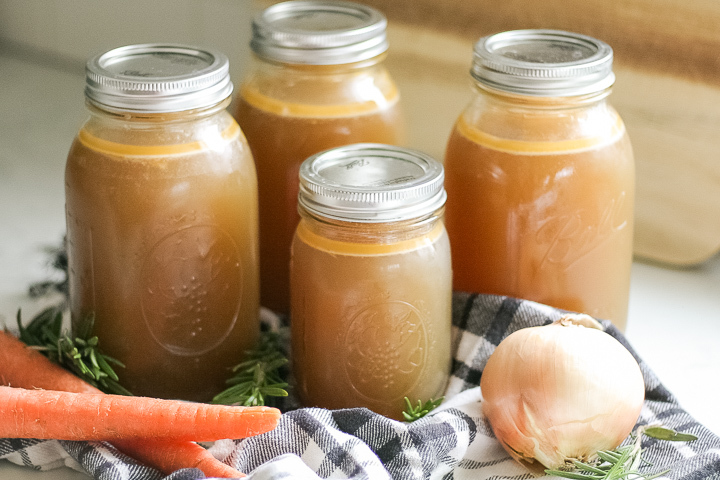 Studies have been done that shown the healing properties of bone broth for gut health, reducing inflammation in our bodies and reducing food allergies. It’s perfect to consume on a daily basis, especially when sick. That’s why you always think to give someone chicken noodle soup when they’re sick. The bone broth aids in quicker recovery! 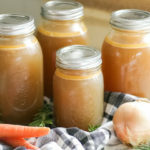 Bone broth can be stored in glass mason jars with lids in the fridge up to 2 weeks. We usually consume it all within a week because we cook with broth so often! We use broth for soups, mashed potatoes, rice, quinoa or making a roux/cream sauce in meals. Freeze extra broth in glass mason jars (leaving enough head room for expansion about 1-2″). Allow the broth to come to room temperature before placing in the freezer. You can also freeze the broth in ziploc bags or plastic containers. Some even like to freeze in ice cube trays and then use just a few cubes per meal when only needing a smaller portion! 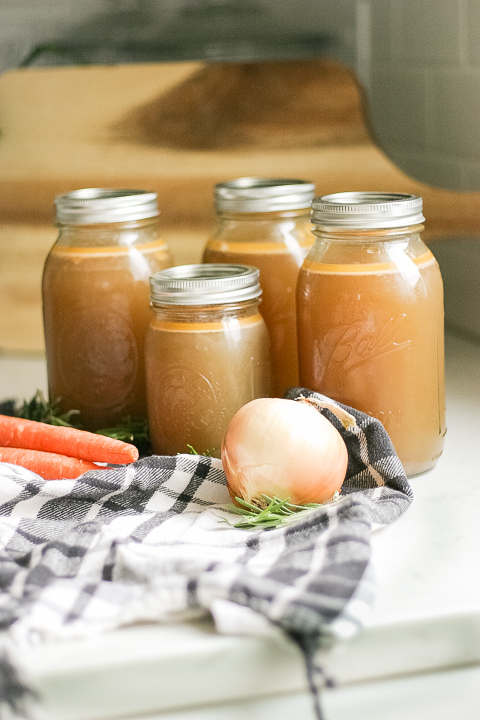 So the next time you buy a rotisserie chicken or cook your own, don’t forget to keep the bones and skin to make your own Instant Pot bone broth. If you aren’t able to make broth right away, freeze the carcass in a bag until you’re ready! As I chop up veggies through the week for other meals, I like to save my scrap pieces and peels. Vegetables such as onions, celery, carrots, zucchini, are placed in a ziploc bag that I keep in the freezer. I continue to add to the freezer scrap bag throughout the week. Once it’s full, I have a bone broth stock bag all ready to go the next time I have a carcass to use! The only thing left to make bone broth is to add spices, vinegar and water, which takes less than 5 minutes to do! So easy right?! No extra time required and less food waste! I’m a nerd, but it makes me so happy to be so efficient. So don’t be like me and wait 2 years until you try making Instant Pot bone broth. Try making it the next time you have bones to use! 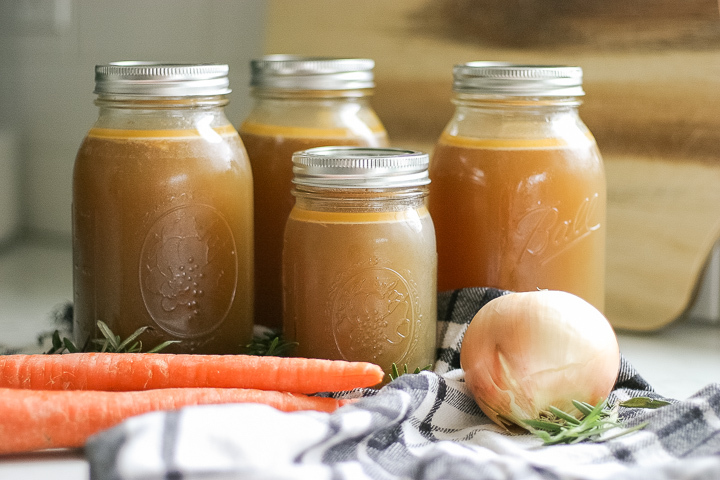 Bone broth provides healing qualities and is the perfect base to any soup. 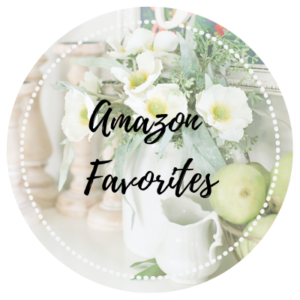 This once time consuming process becomes so easy with the Instant Pot. Don’t be afraid to change it up using different spices for different flavors. 10-12 cups water depending on 6qt or 8qt. Do not fill more than 2/3 way full. Add enough water to cover the top of the bones (about 10-12 cups depending on which size Instant Pot you're using). But do not fill the pot more than 2/3 full. Close lid and turn knob to sealing. Pressure cook on high for 120 minutes. Allow either a full natural pressure release. If you need to speed things along, natural pressure release for 20 minutes followed by a quick release. Pour liquid through a fine strainer into a large bowl. Or use a large metal steaming basket to collect all of the food. Pour into mason jars and store in fridge for up to 2 weeks. If storing in a freezer, leave enough head room in jars for expansion (about 2”). Allow broth to come to room temperature before freezing. Thaw in fridge the day before using. *I collect scraps from vegetables throughout the week as I chop for other meals and have a bag in the freezer that I fill with the scraps/ends/peels. Then it’s ready to use as soon as I have another chicken carcass with no extra vegetable prep or purchase needed! Less waste and tastes great!